As we depart this year’s Chicago Auto Show, we are left with fond memories of the latest and greatest offerings and trends in the automotive world. 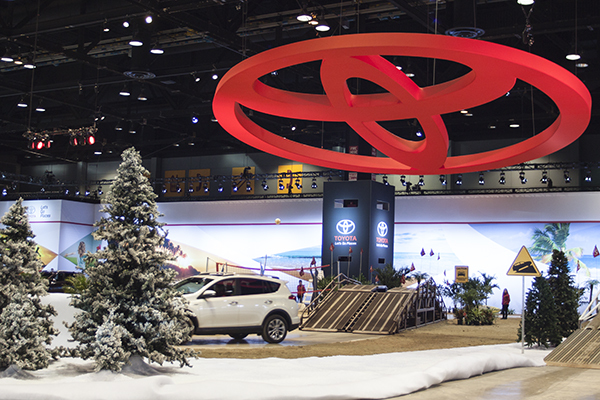 While the cars are cool and all, it is the environments that housed them which transformed McCormick Place into a massive organization of high-end showrooms and memorable experiences. For Generation X, and now the onset of Y, new vehicle sales have dropped over the past few years. This is partly associated with lacking funds and a “share” mentality. On the other hand, baby boomers have a continued passion for cars and the money to pay for them. Toyota adapted their environment to these two mindsets. One half of the space was representative of a showroom, with an open floor plan that allowed comfortable room to interact with the cars on display. This area was geared toward customers who are more adept to have an interest in what’s available here and now. The other half consisted of an experiential driving track. For the Gen-Xer’s who are all about experience, this created a memorable connection point, which can influence future car buying plans and decisions. Photo copyright Fabric Images, Inc.
To tie in the environment and enhance their brand presence, Toyota utilized their overhead space to reflect the quality and innovation of their brand. Two Toyota emblems, 35ft and 24ft wide across, floated above the space, combining the luxury of the showroom with the experience of the outdoor drive. These bold emblems were so well positioned that they were viewable from across the hall floor, as well as from the main hallway. There was no mistaking the commitment of the Toyota brand to “go places” with the attendees.